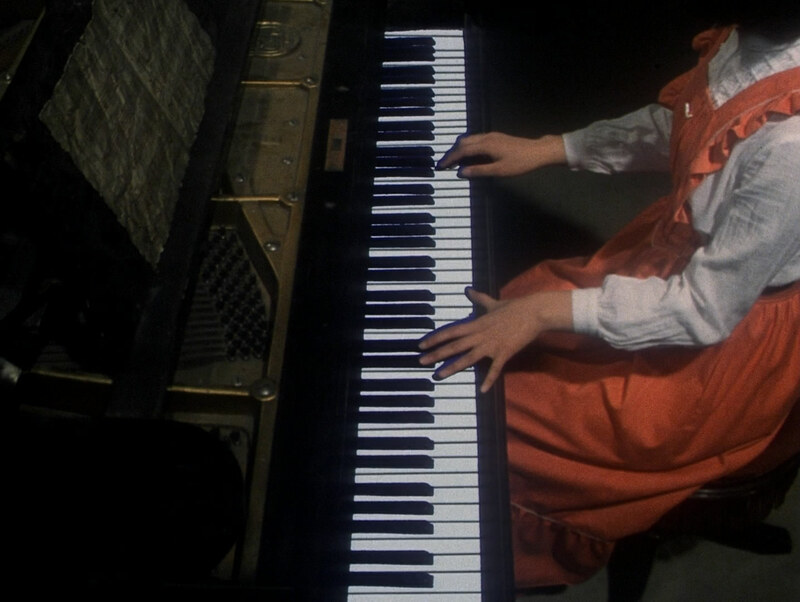 A schoolgirl travels with six classmates to her ailing aunt’s creaky country home and comes face-to-face with evil spirits, a demonic house cat, a bloodthirsty piano, and other ghoulish visions. 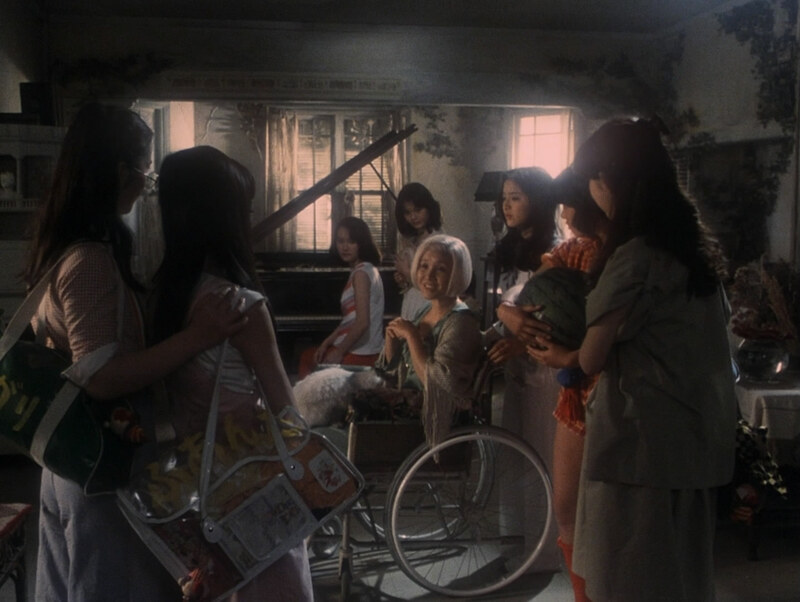 House is a Japanese cult horror film directed by Nobuhiko Obayashi. 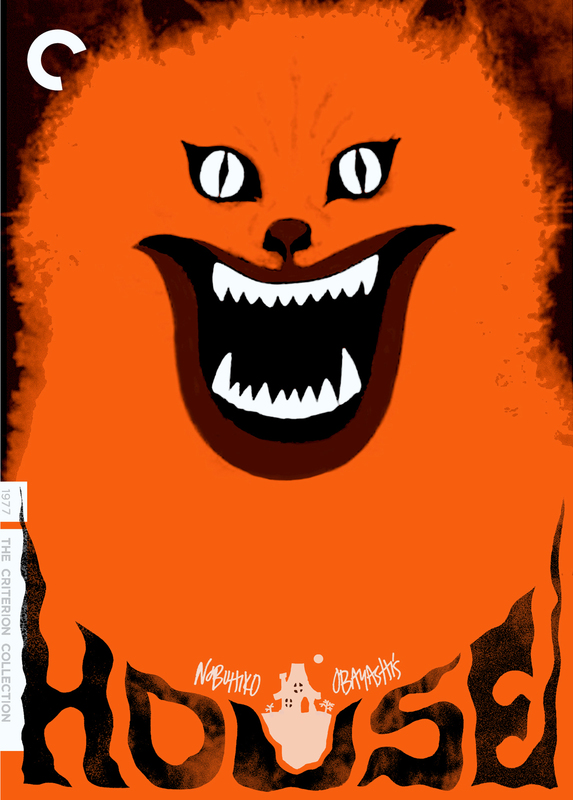 Released theatrically in Japan in 1977, it had been unavailable in North America until The Criterion Collection released it on DVD and Blu-Ray in October 2010. 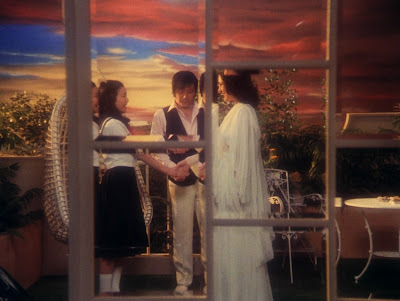 This is an almost indescribable film with a scenario that Obayashi assembled from remnants of his daughter's dreams. It's a cleverly twisted and mashed up concoction of multiple genres with acid-trip visuals, one that Criterion quite accurately describes as "an episode of Scooby-Doo as directed by Mario Bava". The story involves seven young schoolgirls, who like the Seven Dwarves, are all nicknamed after their various character traits, Gorgeous, Sweet, Kung-Fu, Fantasy, Melody, Prof, and Mac. Who on summer vacation, encounter a haunted house that methodically devours them all one by one in a manner befitting their nicknames. It's told using highly stylized sequences, some of which resemble the look of old television commercials, a nod to how the director started his career. 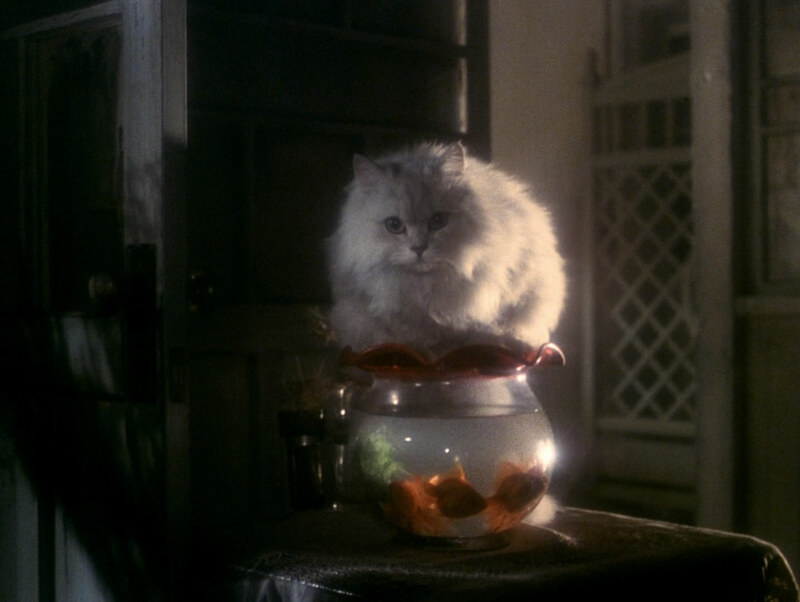 This extravagant style purposefully morphs the horror elements into comedy turning our genre expectations on end. No camera tricks are spared, there are rapid edits, jump cuts, color and haze filters and psychedelic overlays. The set design reflects this same vision as the backdrops are all garishly painted in bright flashy colors, and the exteriors are intentionally obviously flimsy facades. Music is also used to great effect here, with an infectiously catchy recurring theme that sounds like it would be right at home in a 16-bit console RPG, and several other stereotypically 70's flavored tracks performed by Godiego that fuel the atmosphere of insanity on screen. Nobuhiko Ôbayashi's House is an absurdly unique film, one that is impossible to adequately put into words, and really would spoil most of the fun to talk about too much. This is an essential viewing experience for fans of cult cinema and now a permanent addition to my list of films to screen at impromptu movie parties. 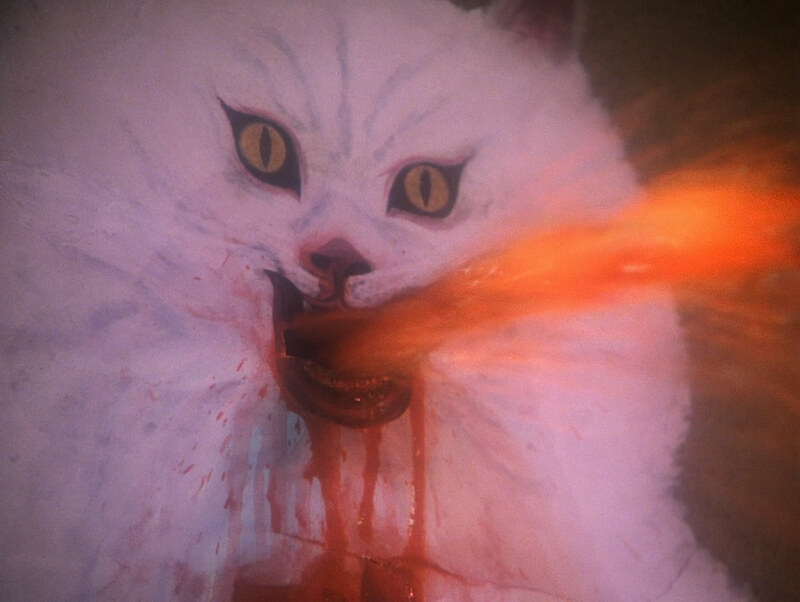 Hausu is one of my favourite flicks, awesome OST from Godiego too. +Followed! Yes, the soundtrack is half the fun! I wanted to see this when Criterion was bringing it out on Blu, but then I heard the film might be a little too unique for my tastes. I might just be persuaded to see it one day though. Great review summing up everything that is brilliant about this film. Spread the word, it needs to be seen! Oh yeah, who was you favourite girl? She's the one on the far left in the second screen shot. This looks very entertaining. And not just because of the cat spewing. Gorgeous, Sweet, Kung-Fu, Fantasy, Melody, Prof, and Mac. I need to see what traits Mac exhibits. Believe or not, I've actually seen this movie! It's was weirdly entertaining. I would recommend watching sometime! Like Michael said below, its the perfect Halloween film. That would be a great time to watch it. Thank you Jack, it isn't really a horror, even if there are scenes and subject matter you would normally only see in one, they are never presented in a terrifying way. Thanks AV, the cat IS awesome. Glad to have you back. Yeah it's almost like two separate films comparing the first half and the second one. You never know what to expect will happen. Haha, I would not bet against it. Even after watching that scene, I wonder what's going on as well. This is one I've actually been meaning to see for a few months now thanks to Banacek. I know I'll be seeing it soon. Just don't know when, exactly. I generally don't go for Horror films, but this one seems like a must watch. Great review, I love that poster. I love the look of it. The cat is awesome, too. I can't thank you enough for giving me good stuff to watch! This is one of my favourite films. While it shares some slapstick comedy elements with Japan, it has an absolutely mad identity all of its own. 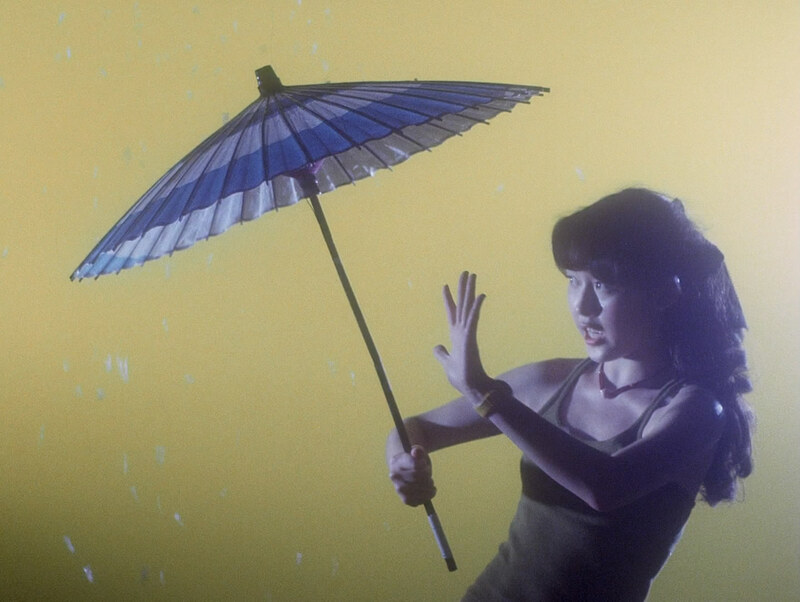 The brilliantly shot bubblegum pop sequences that open the film (the bit with the bucket is priceless) blend nicely into the inventive surrealism of the second half. It can feel a bit stretched at times in terms of pacing, but there's enough demented thrills in there to keep you engaged from sugar-rush beginning to demented end. Sounds intense, was he drug taking when he made it I wonder? What is going on in the final image too? Don't encourage him, he just needs his "seven dwarf" fix. Oh without a doubt, Kung-Fu.